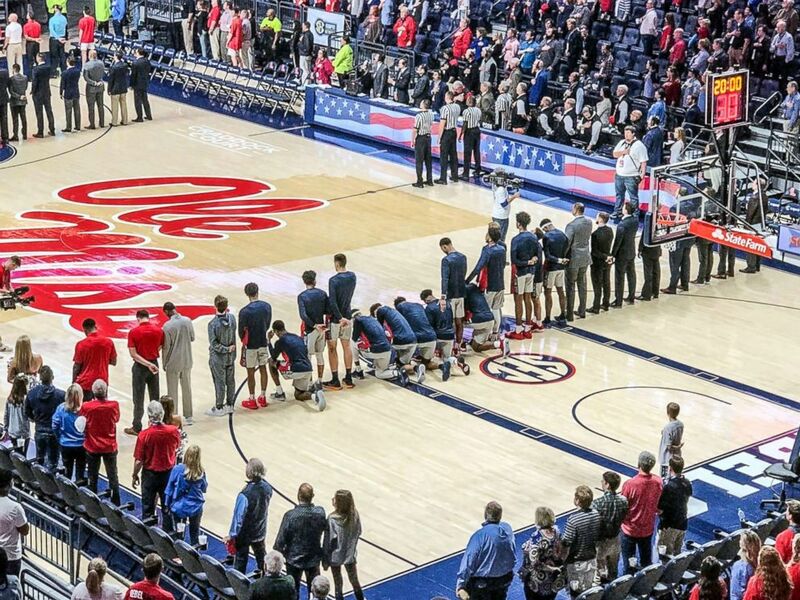 Several members of the University of Mississippi basketball team took a knee as the national anthem was played at the start of Saturday's game to protest a pro-Confederacy rally that took place near the arena. Minutes before the match-up against the University of Georgia started, both teams lined up on opposite sides of the court for "The Star-Spangled Banner," but eight Ole Miss players knelt as the band played the song. Six of the players took a knee one by one after the song began, and another two players knelt during the song's final line, video from the game shows. Two Confederate groups had organized a march on the campus as the game was being played, ESPN reported. When asked during a post-game news conference whether he was aware of his player's intent to kneel, Ole Miss head coach Kermit Davis said he was not, but added that the protest was "all about the hate groups" who were "trying to spread racism and bigotry" in the community. "It's created a lot of tension for our campus," he said. "I think our players made an emotional decision to show these people they're not welcome on our campus, and we respect our players' freedom and ability to choose that." Junior guard Breein Tyree, who appeared to be one of the last to kneel, said during the news conference that there was no discussion among the players on how to respond to the rallies but rather they saw one of their teammates doing it and they "just didn't want him to be alone." "We're just tired of these hate groups coming to our school and portraying our campus like it's our actual university having these hate groups in our school," Tyree said. Kneeling during the national anthem became a controversial form of protest among athletes after Colin Kaepernick, a former quarterback for the San Francisco 49ers, took a knee before NFL games during the 2016 season to bring awareness to police brutality and other forms of injustice against African-Americans. The issue became such a hot topic that even President Trump inserted himself into the debate, calling on the NFL to stop the players from kneeling. Coach Davis, who emphasized standing for the national anthem while he was coaching at Middle Tennessee State, said the Ole Miss basketball team would be one that "respects the flag and the national anthem" when he was introduced as its new head coach last year, according to ESPN. Ole Miss athletic director Ross Bjork said in a statement that the protest "had nothing to do with the anthem" but was meant to send a message to the out-of-state groups that they were not welcome on the campus. Bjork said he had a conversation with the players in the locker room after the game to tell them that he supports them because the university "doesn't want those people here, either." Six Mississippi basketball players take a knee during the national anthem before an NCAA college basketball game against Georgia in Oxford, Miss., Feb. 23, 2019. The Rebels defeated the Bulldogs, 72 to 71.